Beowulf is an Old English (possibly the oldest English) poem. Known to have been written in the tenth century, but with probable older origins, it's verses tell of a time of dragons, sea monsters, smoking swords and throughout it all wassail and riotous assembly in cavernous mead halls. Julian Glover has been reciting the poem for nigh on thirty years, in a version that he has painstakingly laboured over. His editing of the verse has led to it being mainly recited in the contemporary idiom, with an occasional stanza of Old English and his helpful programme notes tell us of history having stressed that Beowulf "should not only be read to oneself, but spoken out loud". Thus it was, for two shows only last weekend, that Glover was to give his final performances of the poem in the Sam Wanamaker Playhouse at Shakespeare’s Globe. The venue was enchanting. 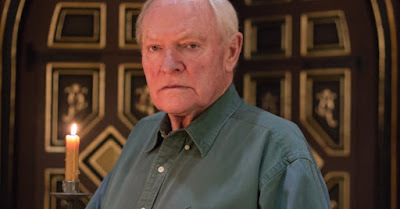 Lit mainly by flickering candles (supplemented by a floodlit yellow wash) the Playhouse offers an elegant Elizabethan intimacy and that it was packed on a pleasant spring afternoon speaks much for Julian Glover's reputation. Glover's delivery is the work of a master. Such is the actor's genius that even when speaking in the ancient tongue, typically unintelligible to a modern audience, his rhythm enhanced by a perfect emphasis on the text's alliterative strengths made even the most incomprehensible language seem crystal clear. Using minimal props (a tankard, sword and throne, all used only occasionally) and dressed in simple, sober modern blacks, Glover's recital, through perfectly honed inflection and nuance, was a step back in time. For what must be nigh on millennia, folk have been entertained by talented raconteurs telling stories and this is precisely the ambience that Glover achieved. A man as at home performing in a Broadway musical as he is mastering Shakespeare, this wonderful actor held the crowd in the palm of his hand. This review covered the matinee performance. Later that evening Glover's son Jamie, an accomplished actor himself, was to inherit his father's mantle by concluding the recital and carrying on its oral tradition. Today’s writers, directors and dramaturgs would do well to attend the future recitals of Glover Junior. Simply staged and beautifully performed, the purest of theatre does not get better than this.